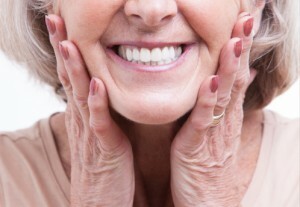 Are you a denture-wearer or do you know someone who wears dentures? Then you are probably familiar with a common complaint: dentures slip. If you think about it, this problem can almost be expected, because ordinary dentures simply fit on top of soft gum tissue. There is, however, a solution. Implant supported dentures solve the problem of dentures that slip. With implant supported dentures, Dr. Barry Holden can secure your smile just as he’s done for many others in State College and Williamsport, PA.
An implant, or dental implant, is a biocompatible titanium post that Dr. Holden surgically implants into your jawbone. When needed to replace one missing tooth, this implant is topped with a custom designed porcelain crown. In the case of implant supported dentures, Dr. Holden strategically positions a number of implants all along an arch. As you heal over the course of three to six months, these implants fuse with the surrounding bone tissue in a process called osseointegration. This fusion is what creates the solid foundation that hold dentures firmly in place. During the healing process, you will have a temporary denture. Once you have completely healed, you’ll receive your custom fitted dentures. The staff will show you how to properly attach your new dentures to your implants. As with ordinary dentures, you’ll need to regularly clean and disinfect your implant supported dentures and take care of your gums. In addition, we don’t recommend that you sleep with your dentures in place. We do have a recommendation if you’re tired of dentures slipping—consider implant supported dentures from Dr. Barry Holden in State College. If you’d like to learn more about how implant supported dentures can give you a sturdy, steady and beautiful smile, then call the office of Dr. Barry Holden. With offices in both State College, PA, and Williamsport, PA, we conveniently restore smiles for people in Bellefonte, Lewistown, Huntingdon, Clearfield, Lock Haven, Bloomsburg, Altoona, Danville, and the surrounding areas.